10. "Madea's Witness Protection" (2012) This was the second-highest-grossing Madea movie to date, but it came along at a time when Perry was making minor noise about retiring the character, and it shows. The film looks cheap even by Perry’s budget-minded standards, the jokes are flat, and the director appears tired of the role, having almost no comic rapport with co-star Eugene Levy. 9. "Madea's Family Reunion" (2006) The follow-up to Madea’s debut in “Diary of a Mad Black Woman,” this movie proves that less Madea screen time means less entertainment. A dramatic abusive-fiancé storyline dominates the film, as do side characters’ preparations for a wedding and family reunion. Madea’s presence is limited to dispensing homespun wisdom to young Keke Palmer, a now-infamous line about shooting Tupac for a parking space, and the delivery of Oprah Winfrey’s “All my life I had to fight…” speech from “The Color Purple." 8. "Boo 2! A Madea Halloween" (2017) The first one made money, so Madea gets to be scared stupid all over again in a sequel so sluggish and haphazardly thrown together that it makes the first one seem like classic comedy by comparison. Madea spends most of the film sitting in a Cadillac and having her most florid swears awkwardly dubbed into softer versions. 7. "A Madea Family Funeral" (2019) Perry says this is the last Madea movie, and maybe it's time if this inert effort is all he can muster for his signature comic creation. Madea tends to do a lot of sitting around in this one -- a dramedy about infidelity and sudden death -- mocking the stupidity of those around her or dispensing old-fashioned life advice. Missing is her trademark wildness, her willingness to ignore all social convention and sense of decency, replaced by sedentary -- but often still quite funny -- one-liners. Come back when you're feeling it again, Madea. 6. "I Can Do Bad All By Myself" (2009) The ratio of Madea to melodrama is sadly unbalanced in this near-musical about a troubled nightclub singer (Taraji P. Henson) and her struggle to get by, all while having to deal with caring for her recently orphaned niece and nephews. Madea drops into odd moments here and there for comic relief, but the real reasons to watch are Henson’s moving performance and Mary J. Blige showing up to knock the title song out of the park. 5. "Boo! A Madea Halloween" (2016) Chris Rock delivered a readymade name for this dare of a movie in “Top Five”; otherwise it would rightly be called “Madea Scared Stupid.” This time around, she chases her nephew’s rebellious teenage daughter from a fraternity Halloween party to a fake haunted house, battling a gauntlet of zombies, trendy murder-clowns, idiotic frat boys, and slasher movie set-ups. Our heroine tumbles extravagantly down staircases, babbles incoherently, and twerks to a Tyga track. In other words, it delivers pretty much what you expected when you bought a ticket. 4. "A Madea Christmas" (2013) Christmas needs saving, and it’s Madea to the rescue. Why it needs saving is irrelevant, but it involves a mean corporation, Larry the Cable Guy, and Lisa Whelchel from “The Facts of Life.” The solution involves Madea donning a Mrs. Claus outfit and laying waste to everyone who gets in the way of her Wonderful Life. She fights the KKK, ties up a misbehaving child with Christmas lights, and calls at least one person a “Satanic loudmouth diarrhea woman,” before going full-on anti-Linus and recounting a bizarrely backward Nativity story. Christmas crisis averted with antics, bringing much-needed chaos to a character whose energy seemed to be flagging. 2. 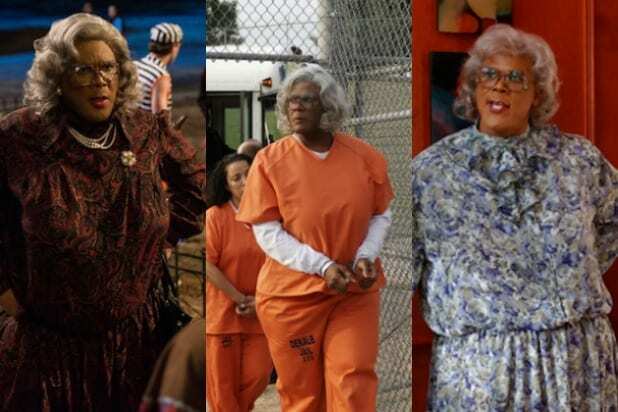 "Madea Goes to Jail" (2009) Madea’s criminal history involves a litany of charges including identity theft, insurance fraud, and attempted murder. This time around she defies court-ordered anger management (with Dr. Phil) and mocks her daughter Cora’s peaceful faith in Jesus. Landing in prison after destroying a racist woman’s car, she befriends serial killer Sofia Vergara, battles a predatory inmate, and gets released on a technicality, dancing out of the joint. The highest-grossing Madea film, and the one in which she’s almost conscience-free, as close to pure id as a human being can be without transforming into a cartoon Tasmanian Devil. 1. "Madea's Big Happy Family" (2011) The perfect combination of family dysfunction (featuring a solidly moving performance from Loretta Devine as a cancer-stricken mother) and a barnstorming Madea. The matriarch comes on like a tornado as she destroys a fast-food restaurant with both her car and her body, freestyle-lectures Christians on the “prescriptures” in the Bible, handily insults every person who crosses her path, and nearly meets her match when sparring with the wild and wicked Teyana Taylor.